IPSU is a selective, orally available and brain penetrant OX2R antagonist with a pKi of 7.85. 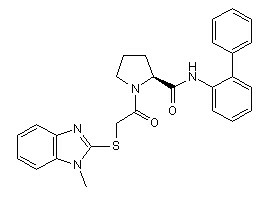 DORA-22 is a dual orexin receptor antagonist. SB-334867 free base is a selective non-peptide orexin OX1 receptor antagonist with a pKb value of 7.2. SB649868, also known as GSK-649868, is an orexin receptor antagonist potentially for the treatment of insomnia and sleep disorder. Suvorexant (MK-4305) is a potent dual OX receptor antagonist with Ki of 0.55 nM and 0.35 nM for OX1 receptor and OX2 receptor, respectively. Phase 3. Schisantherin A is a dibenzocyclooctadiene lignan isolated from the fruit of Schisandra sphenanthera. Schisantherin A inhibits p65-NF-κB translocation into the nucleus by IκBα degradation. 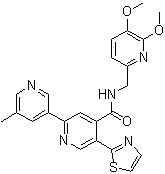 MK-3697 is a potent and selective Orexin receptor antagonist with Ki = 0.95 nM. 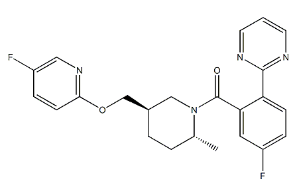 MK-6096 is an orally bioavailable potent and selective reversible antagonist of Orexin 1 Receptor (OX(1)R) and Orexin 2 Receptor (OX(2)R).